Primeval Labs Mega Pre: Super Well-Rounded Stim-Free Pre! Take 2 rounded scoops of mega pre in 10-12oz of cold water 15-20 minutes prior to training. Assess tolerance by starting with 1 rounded scoop. Never exceed 2 rounded scoops. One of the best formulated all-around stim-free pre workouts on the market? We think so! See CJ discuss the ingredients below, or read more in our Mega PRE blog post! Better Stamina And Endurance! Increases Performance! Supports Muscle Growth! Reduced Fatigue! When you hear the word "pre workout" you almost always assume it's some form of high-energy, caffeine laden prop blend. Sadly, this representation of what a pre workout is a far cry from what a pre workout should be. There are several more important elements to a properly formulated pre workout than simply a truckload of stimulants. Key attributes you need from your pre workout are -- stamina, blood flow, and focus. Without these three traits, you're essentially just running around the gym like an energy-crazed maniac. 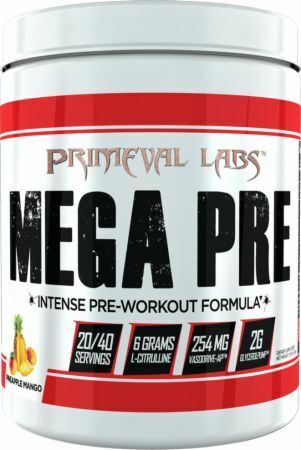 Primeval Labs is set to revolutionize the supplement industry and your conception of what a pre workout is with Mega Pre. What is Mega Pre?What is Mega Pre? Mega Pre is everything your pre workout should be. It contains 8 research-backed ingredients proven to enhance NO production, blood, focus, stamina, and overall performance. There are NO stimulants, meaning Mega Pre is ideal for every athlete, anytime of day -- morning, noon, or night. Stimulants are cheap, a properly formulated pre workout loaded with proven ergogenics isn't, and that's exactly what you get with each serving of Mega Pre. Better blood flow is crucial to performance, stamina, and massive muscle pumps. Mega Pre includes the king of all nitric oxide boosting supplements in L-Citrulline, and at a whopping 6g dose! L-Citrulline is significantly more effective than L-Arginine, and as a precursor to arginine, markedly increases NO production, vasodilation, and blood flow in your muscles. Citrulline is also proven to enhance ATP production, Vo2 kinetics, endurance, performance, and even lean body mass! Betaine is a metabolite of choline shown to increase lean mass (i.e. muscle) as well as strength. This essential performance-enhancing supplement enhances creatine production in the body and improves hydration, due to its actions as an osmolyte resulting in significantly greater strength, power, muscle growth, and overall performance. Ribose is a monosaccharide (simple sugar) created from glucose digestion that's used by the body to form ATP -- the energy "currency" all your cells. As you know, intense training depletes ATP, which can substantially reduce performance if you're not able to replenish your ATP stores fast enough. D-Ribose is an incredibly effective, highly bioavailable form of supplemental ribose documented to enhance ATP replenishment, enabling you to train harder for longer periods of time. Proper hydration is essential to optimal performance, as even the slightly drop in hydration levels can increase fatigue, decrease performance, and reduce performance. To ensure your muscles are always fully hydrated, Mega Pre includes a beefy 2g dose of GlycerPump, the most effective, and stable, form of glycerol on the market. GlyerPump contains 65% glycerol by weight and never clumps in the tub or leaves gobs of goo on the sides of your shaker cup, unlike all other forms of glycerol-containing products on the market. GlycerPump transforms your muscles into ultra absorbent sponges that soak up extra water leading to swelling is superior hydration and stamina, as well as some powerful "water-based" pumps! Find yourself having difficulty focusing during your workouts not matter how many stimulants you took pre workout? That's because most stimulants simply give you the energy to perform, but very rarely give you the focus you need to make the most of every rep during your workout. Mega Pre includes a full 1g dose of choline bitartrate, a form of supplemental choline that increases acetylcholine ("the learning neurotransmitter") production. With greater acetylcholine levels, you'll experience significantly better focus and concentration while training as well as a strong mind-muscle disconnection. Choline bitartrate ensure you're always "in the zone" during your training sessions, enabling you to "feel" every rep for better gains each workout. Derived from the branched-chain amino acid (BCAA) Valine, L-Norvaline is a powerful amino acid that enhances cardiovascular function and blood flow. Norvaline synergizes with L-Citrulline to reduce arginase activity in the body and promote stronger, longer-lasting nitric oxide production resulting in more powerful and sustained muscle pumps, blood flow, and performance. A vastly underused ingredient, VasoDrive-AP is a cutting edge ACE (Angiotensin converting enzyme) inhibitor shown to enhance blood flow and increase nutrient and oxygen delivery to working muscles providing unrestricted nitric oxide production and blood flow to your working muscles. ACE is a devilish little enzyme that can reduce blood flow via vasoconstriction, which is the exact opposite of what you want while training. VasoDrive-AP reduces ACE activity in the body promoting optimal blood flow, arterial elasticity, and blood pressure. It's also been shown to enhance insulin sensitivity and athletic performance via ACE inhibition. To further increase your acetylcholine production and enhance the effectiveness of the choline bitartrate, Primeval Labs has included 100mcg dose of the powerful nootropic Huperzine A.
Huperzine inhibits acetylcholinesterase, the enzyme that breaks down acetylcholine. Negating the actions of acetylcholinesterase ensure long-lasting focus and a superior mind-muscle connection while training.